We have often been unfairly compared to the FLDS because of our retro views on marriage and wifely duty, so a few of the girls at the organization started reading up on the Fundamental Latter Day Saints, just to make sure we weren’t going down their path (we’re not). As a result, over the years, we’ve become quite acquainted with the writings about, and by the FLDS. “In Light And Truth: Raising Children in the Family Order of Heaven,” a crucial book copyrighted by Rulon T. Jeffs, the 85 yr old codger prophet Musser was forced to marry at 19, was actually compiled from the meticulous notes of Sermons taken by Musser during her schooling days. (Don’t bother looking for the book, there is no ISBN). So when it came time to provide damning evidence against the defense, Musser was really the FLDS’s worst nightmare. She was married to the prophet; she saw the inside machinations of his notorious son Warren Jeffs, and she has a great head for keeping track of details. She looks great (which can never be discounted in the easily swayed opinion of the public) and has an infectious positive attitude which carries the entire book. Most of all, however, her heart is in the right place. Some of the most memorable lines include the closing of Chapter 17, when Musser goes to bat for “her people,” reminding readers that not ALL FLDS people are bad, that sexual abuse does not occur in ALL FLDS families. That is really what propels the personal journey of The Witness Wore Red. Musser never gives up an opportunity to talk about her love for her people, realizing they are put in a tough spot not of their choice. 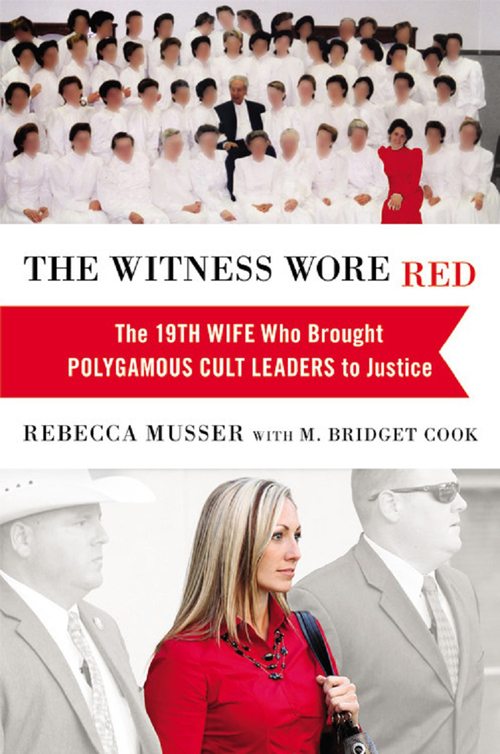 Aside from the horror stories, in many ways, The Witness Wore Red is a spiritual journey that is the real path to reaching Musser’s internal “light and truth.” With each passing chapter, the author experiences new insights to her personal relationship with herself, God, and earthly “representatives” of a higher power. One would think that after her escape, it would be smooth sailing most of the way, but we find out that it was anything but simple. The prose is easy to digest, there are adorable black and white pictures of Musser and her family, and it’s an easy page-turner. It takes a great individual to make many astounding personal sacrifices to bring the proponents of the “one man rule” to justice. Musser is also founder of ClaimRed Organization, which helps and heals oppressed women. Check it out.